Archive Alert! Awright, Sweetpea, 'owa yer doin'? This time last year I met naked chef, Jamie Oliver! What a cutie! We can't wait to see you again. Bon voyage! Have a good trip back, et bon retablissement. 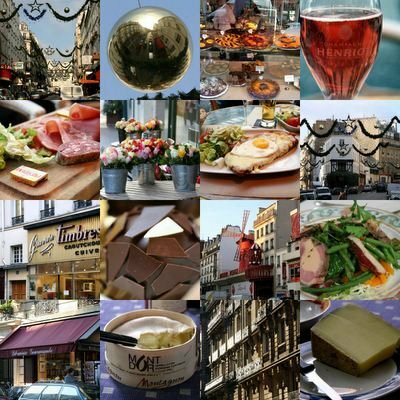 Vos photos de Paris sont superbes! Amazing photos! I esp like the cakes, cheese and chocolate...and the windmill. Glad to hear Fred is much better, hope you have a nice flight home! Thanks for posting such a lovely Parisian montage, makes me want to go straight to the airport! wheeee! well so glad to hear that fred is back on attack, and that you two are headed for home...do you get to see any of chicago? i just went for my vacation and had such an AWESOME time! Paris ,moi aussi je viens de le quitter .........ja'i tant de choses encore à voir. Those photos are beautiful, but none of the hospital? LOL Glad Fred's better and you are headed home...home is always nice. Have a safe trip back home and thanks for all of the photos...makes me travel sick - speaking of which, glad Fred is better! Hey, Your blog is cool. I run a blog on Quick Easy Receipes. You may check it out. maybe it was just me, but today when i went to your page i got a flash floating pop-over for an online casino on top of your page. that made me sad. Anon - thanks for the heads up. The problem should now have been fixed. It was caused by some free software I was using in my blog roll which I have now deleted. Everyone else - thanks for all of the kind words and good wishes.